Molly Lannon Kenny, once known as Molly K, joined her first “real” band in 1993. When she answered an ad in The Stranger for a bass player for the then popular, and bass-less, 66 Saints, she had never played the bass in her life, although she came out of the womb singing. Ironically, she did not sing for 66 Saints, but instead played the bass. She grew to love the bass and play it in a totally unique way – using chords and pedals to create soundscapes to enrich the total sound to the band. After playing with 66 Saints for two years, she left the band with drummer Kat Carlisle, who she continued to play with for the next seven years in various formations, most notably as the rhythm section for their band Matchless, where Molly took on the role of front person and lead singer while refining her bass style. Matchless went on to play Bumbershoot, SXSW, NXNW, as well as to tour extensively and release three records. During that time, she also created “Soloplexus – an evening of small acts” along with Tess Lotta and Karen Hancock. Soloplexus was a bi-monthly music night in which musicians could stretch their wings outside of their “main gigs” and create short, 20 minute, sets of original and unique music. It was during this period that Molly took on the name Firepitbelly and began playing solo bass shows around town and at open mics around the country. 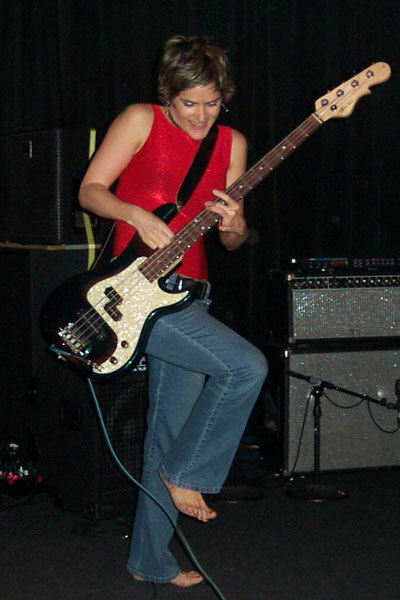 Once Matchless ended, Molly continued to play as Firepitbelly, bringing on various drummers to complement her solo bass playing, and eventually played in this configuration under the name Siren. She made her final recording as Siren in 2007, and since then has been focusing on her non-profit yoga and therapy training programs, which bring her all over the world to teach. She credits her many years in bands as cultivating the seeds of discipline, relationship building and creativity. When she is in town, she can be found at her Central District studio, The Samarya Center, or in bed by 9 o’clock most nights. If she’s not in Seattle, or teaching around the globe, she is most likely relaxing at her home in Mexico. Where she just might pick up the bass again and start playing renditions of Margaritaville to make a living.